Genuine Extra Stimulus LaserBoy Correction Amp Boards! Topic: Genuine Extra Stimulus LaserBoy Correction Amp Boards! This is a totally new design of the LaserBoy Correction Amp board! This is the first one I did completely by myself (other than all the ones I made by hand on copper proto-board). 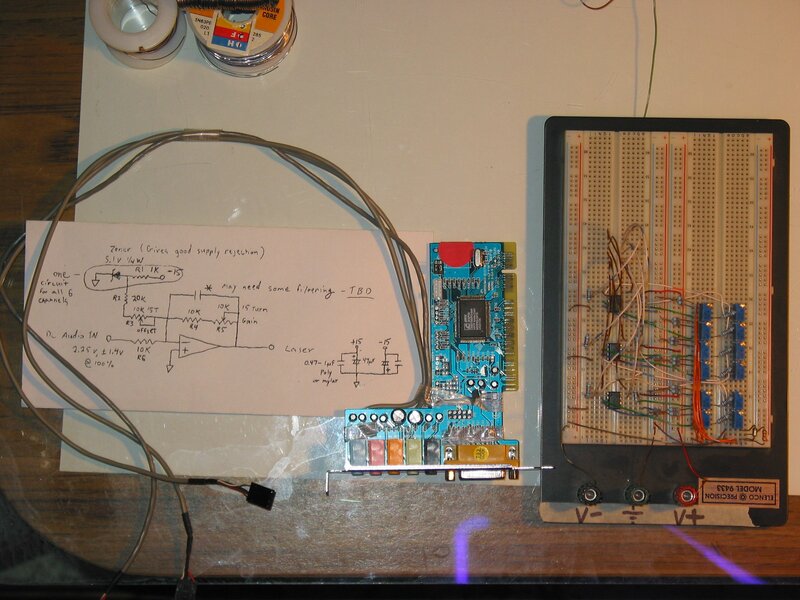 Back in 2008, I did a layout and the trace routing for a board and drlava did the circuit CAD. This is the green board that has been out there pictured all over the web. This new red one is a bit smaller and features all of the design revisions since then. It has a variable negative voltage regulator instead of a fixed one. It has much finer resolution for the offset null and it has a higher gain factor. Plus it has 5.1v zener diodes to prevent over-voltage on the color channels! It is a single sided board with almost 100% copper coverage for the ground plane. Right now I am waiting on shipments of all the parts to make finished LaserBoy DACs like the one pictured here and kits of the PCB and all the parts. This kit will also work with PCI internal sound cards without the need of the DC/DC converter by using the +12 and -12 V from the PCI slot. I will probably make a few finished examples of that configuration for sale as well. I will let everyone know when they are available. Re: Genuine Extra Stimulus LaserBoy Correction Amp Boards! I just got some more USB sound boxes today. So I will be building a few more complete units like the one pictured here. I'm still waiting on many different shipments of parts to be able to make complete kits of the PCB. If anyone is interested in any of these things, please send me a message and let me know what you want. I only have a limited number of boards because I'm trying to gauge the interest in this venture. So, don't send me any money, but do get your name on a list and I will try to get together exactly what you want. I'd like to get $120 for a complete LaserBoy DAC in a VHS case (with stereo audio RCA jacks). I'm thinking about $40 for the PCB and parts kit (no sound device). ... plus the cost of shipping. I am going into the hospital on 9/11/13 for a total left hip replacement. This will be the third one on the left. I have already had three hip replacements on my right! So I will be out of the game for about a week or so. But I will try to get back to it ASAP! Thanks for doing another run of these kits, James! Man I tried ordering one of these a couple years ago from somewhere else (Dr Lava) and they were never in stock again. Take a look at my breadboarded corrrection amp you are helping me finally get rid of after a couple of years! Makes it really challenging to take my projector to friends house .... Gotta bring my schematics, a meter, etc cuz if a wire pulls out during transit sometimes it takes a little while to get it back in... LOL Although I do admit I like the looks of the breadboarded circuit in a do-it-yourself fun way. By the way... Are there any other fellow laser folks in the Chicagoland area ? Hey Jason! Welcome to The LaserBoy Forum! Nice! That's about how I got started back in 2004! Kits are available and shipping now! I've already sold a few of them to satisfied customers. Shipping in the USA is $6, international is $20. The same is true for more than one kit in single shipment. Please contact me directly to place your order. Wow, in just a couple days this kit showed up at my doorstep complete with parts list. It arrived packaged well with no damage, picture 1. I was pleased to see a DB-25 connector with ribbon cable already attached to a header was included! I am very impressed with the included components and quality of the PCB, picture 2. James even went through the trouble to specify colored jumpers (R,G,B,yellow) for the modulation correction amps! Picture 3 and 4. No schematic is provided, which for me is OK. The board requires only +5VDC (How nice is that ?) and uses a DC-DC converter to provide +/-9 VDC. That eliminates the need for a power supply cuz the +5VDC comes from the USB soundcard. The only thing I need clarification on is the part of the procedure to set up the offset bias. "With no signal, turn the voltage regulator pot (also 500 ohm) so that you are close to zero volts on all outputs. Look for the lowest voltage of all channels and make sure you are just a bit on the positive side. If you measure the DC offsets directly from each channel of the DAC, you can measure the negative offset voltage from the test pin on the correction amp (V_off) and adjust it to be -1.5 times the offset you measured from the DAC channels. That will get you pretty close. Let the thing sit for a while and settle. Re-adjust as needed. Now with all the channels measuring some little positive voltage (from about 30 to 120 millivolts) you can trim out the offsets. Turning up each 500 ohm pot per channel adds a bit of negative voltage." Looking at the traces the op-amps get -V supply from the adjustable LM337, which I think is provided to compenstate for different sound card offset voltages. I'm assuming the op-amps all have a +9V supply. James I am unclear on exactly what V_off is connected to and why it needs to be adjusted "to be -1.5 times the offset you measured from the DAC channels". Eagle CAD is good stuff! The test pin V_off is connected to the output of the negative voltage regulator. Both internal and external sound cards are usually all positive devices. So the outputs direct from the DAC channels have a DC offset voltage that is above ground. This offset voltage can range from about +1.2V to +2.5V DC. For standard audio purposes, a capacitor in series with each channel of the DAC blocks the DC. So the variable negative voltage regulator is adjustable. This negative voltages is summed with the output of each channel of the DAC at the inputs of each op-amp. This is how the DC offset is nulled out. Since the input resister on the DAC channel is 10K and the input resister on the V_off is 15K (going into the op-amps), the ratio between the two is -1.5 to 1. The 500 ohm variable resister in series with the 15K resister gives you just enough room to compensate for any slight differences between the channels. Thanks, James! You are THE MAN! Please keep asking questions. It's all good. Well this project got put on the backburner due to summertime activities but I'd like to keep it moving along. Is the preferred soundcard to use still at Dealextreme? This laserboy DAC is going to be used with brand new ScannerMAX 506 scanners I just purchased from Pangolin. Pangolin does not yet have their amplifiers available so I'm purchasing a modified one from Mixed Gas of Photon Lexicon. These scanners are very fast, and I can't wait to drive them with Jame's DAC. So if anyone has a part# or supplier for a good USB soundcard please let me know, because I'd like to keep my current soundcard on my breadboarded DAC and 1st projector. There are going to be two projectors in the house by the end of this winter, I'm SO excited! The dream of projecting beams and graphics at the same time is within grasp! It's about the most common USB sound card that does Dolby 7.1 out there. They are pretty much generic and lots of places sell them. You can find them on eBay for less than $20. Make sure it looks like the ones pictured all over this forum. It should have a C-Media 6206 chip in it.